Anyone who has ever written a business plan (or attempted to), knows it’s not a simple process (I had originally written not a ‘fun’ process, but who knows, maybe this is something you enjoy?). I had to write a formal business plan once. It was when I was getting ready to open a physical retail Scrapbook store with a business partner. We found our location and the property management company wanted a business plan. We had plenty of research, examples of products, scrapbooking in general and we had our appointment set. So I went to the office store and bought a software program to write the business plan (this was way back in 1998… so what was available online pales in comparison to what you can find today). It took me 8 hours to plug through the entire ‘fill in the blank’ business plan. Of course most of what I projected was just that… projections. I probably could have zipped through the program in a quarter of the time had I known the property management company was just going to ‘skim’ through the business plan (in fact I probably could have written some of my answers in another language and they wouldn’t have noticed… but we’ll leave that alone). Which is why I was SUPER excited when I came across the 1 Page Marketing Plan by Allan Dib. 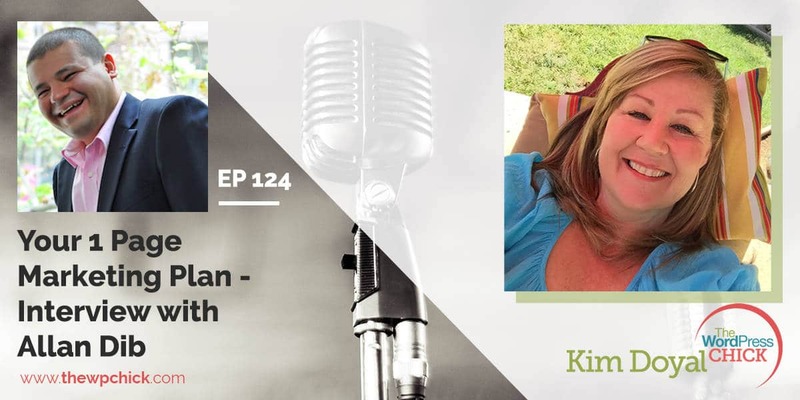 Once you listen to how Allan changed his own business through creating a 1 Page Marketing Plan you’re going to want to jump in and grab the book. When did you get into online marketing? Let’s talk about your book, The 1-Page Marketing Plan. In the book you talk about “the fastest path to money”… which I love, because there’s SO much noise online about passion, etc. , which is important, but it’s hard to do that work if you don’t have any money. What is the 1-page marketing plan? Let’s talk about the wrong type of business plan… can you share a little bit about that with the listeners? I’m assuming that a lot of people listening to this show are not large agencies… what is one thing they could start implementing today that would make the biggest difference? Kim: [00:00:25] Hey what's up everybody. Come to another episode of the Wordpress check podcast. We have a nother. We have another author on the show today and I'm super excited by the way I am. Kim Doyle your host. The word crazy chick. Today we have Alan Dib on the show and I'm super excited. He's written a book called The one page marketing plan and the subtitle is get new customers make more money and stand out from the crowd. I don't know about you but I have done some business plans and you know the idea of a one page marketing plan to simplify my life Holy moly I loved it. I think you guys can enjoy this episode again this is Alan Dabb and he is the author of the one page marketing plan. So I will pass it over to the interview. Enjoy you guys. Kim: [00:01:23] Thank you so much for being here. Allan: [00:01:25] Hey Kim. It's a pleasure. Kim: [00:01:27] I am super excited to talk to you. You know it's funny too as before we had connected. I actually had gotten your book spot was like bonus. That was great. But also I always ask people and I feel like I don't know if people are tired of this but I find a ton of value in sort of a little bit or backstory. So before we get into your business and the book what were you what were you doing that brought you to this place. If you could give us a little bit more backstory then be great. Allan: [00:01:55] Look I was a little bit like the typical sort of entrepreneur and still I thought I was good at the technical thing I did which at the time was I wasn't basically a dead product. I was trying to run my own business and look I was just struggling. You know I was so good at what I did and just frustrated because you know the money in the bank just didn't reflect that. That's really when I started studying marketing and then really try to get a handle on the things that can help you grow your business. And basically working on the business on time I started working on the business rather and in the business. Anyway long story short I grew that business and grew into a national artsy business that. And then more recently I had a telecom business which we grew very fast in the first four years. We were in the top 100 fastest growing companies in the country and sold off a couple of years ago as well site. So yeah. Now now I'm basically taking the stuff that helped me grow my last couple of businesses. Kim: [00:03:09] Love it. Any time somebody can go from there. You know I think like I said Gerber and E-Myth says you know sort of that technician role where you're in your business your hands on all the time to see the bigger picture is huge. So when you do now with obviously being an ITN everything you've always been in the online space but with with your previous companies were you doing you know the blogging the content marketing as well or was that a different space. Allan: [00:03:36] No I don't really look at the time. I mean my second business which I sold was in 2012 site. Digital Marketing was sort of it was starting to sort of take off really towards the end of that business. Yes we did do some digital marketing some Web sites stuff but it's not like as big and as hot as it is now. So we were really doing old school stuff we were doing direct response copywriting all of that sort of stuff. And as I said in the book these are the fundamentals so I mean the online space that's a media and it's an awesome made it's all love it as a media but it's important to put it in perspective. It is just the media. So you still it doesn't take away the marketing fundamentals that you might use an indirect marketing in print or anything else you really need to still understand the market fundamentals to have a good success in your marketing campaigns. Kim: [00:04:37] I've said this on the show a few times recently where you know I have found myself going back to like old school copywriting and in sort of basic cop. Like email copy and those things that were 50 60 years ago and are still working today because again those are the fundamentals so I love all of the fundamentals and although I like technology's changed. Allan: [00:05:01] You know people have been trying to you know there's a software in this paper which I call which way you know which way really has changed in the last six thousand years of recorded history. I mean the things that pushed people's buttons a hundred years ago or a thousand years ago the same things that are pushing people's buttons today. Kim: [00:05:24] It totally and do you find that a you know. I keep looking at the amount of physical subscription boxes. And that that whole model's interesting but I think there is using some core direct response marketing. I know you talk about tactics and strategies to which I live but in terms of you know people are getting back into some of that stuff it's a great way to stand out and not that they ever went away but I think there's this idea that because we live in you know this information age in this digital age that everything has to be online and that's not the case. Allan: [00:05:58] Yeah and it's just really this broad shiny object syndrome way. Allan: [00:06:03] You know the latest social network comes out and everyone jumps on that and the latest trade comes when people jump on that. Allan: [00:06:11] And that's so cool what I'm into that too. Allan: [00:06:14] But again as you cited you know the fundamentals that change you. You do need to produce good content. You do need to write compelling copies of all these sort of little bright shiny objects doesn't really take away from the fundamental. In fact that helps them get it. Kim: [00:06:35] That's a tweetable but let's look let's jump into the book because I've got a ton of questions for you. First before we get into the content what inspired you to write the book. Allan: [00:06:46] So you look at my site basically tell the story at the beginning of the book way in my first business. Allan: [00:06:53] One of the one of the axioms that I did I hired a consultant to help me write a business plan because you know and that was probably one of the only smart moves I did early on in terms in terms of working on the business. But you know and he helped me write this awesome 200 page business plan and had charts and graphs and everything. And literally after after I spent thousands of dollars with this consultant I shove this plan in the top drawer of my desk and I didn't say it until we were moving offices a few years later and I was planning at my desk and looked at it and I tossed it in the trash and thought you know what a waste of money that was. So basically when I thought about it later I thought really the only part of that business plan that was worth anything was a middle section it was called the marketing plan and you know from that marketing plan a lot of differentiation and at positioning products come from that. Allan: [00:07:57] And even though I never referred to it again the prices that we did to create that market and that was hugely valuable. Now I wanted to basically distill that process in a really super easy branded way that anybody could understand that can do. I didn't want people that hire consultants staff to go out of pages to dig through convoluted textbooks and things like that site. So basically I thought how can I just you know the 80 percent or more of the value over of a business plan onto one single sheet of paper onto one page and and that's where the one page marketing plan concept came from. And so even before writing the book I'd shared that with clients in our head that when I was taking some stage and people really really reacted well to that I was very fascinated by the ability to be able to create a food marketing plan and we're not holding anything back. This is a motley plan that takes you from to customer from being a cold prospect to being a writing fan on a single page. So that's basically the concept for the book. Allan: [00:09:06] And where we come from. Kim: [00:09:09] I love it. And you know it's funny as I actually did that I owned a retail scrapbook store like back in 1998. And to get the lease with the property managers they wanted a business plan so and I was like 28 at the time and I went out and I bought software and I sat down and I just felt a knot and they were like wow this is great. Kim: [00:09:28] We never looked at again we never touch it again. It was it was like we spun out this big fat report for them that looked beautiful and they were like oh OK this is great. I was like You've got to be kidding me like that really you know. And as a young adult it was like Is this really how business works. Kim: [00:09:43] But either way I've always been you know with corporations before so. Allan: [00:09:51] I wanted the one age marketing plan to be something practical something that could clean up on a wall in the office and just research it and refine would be a living document. Kim: [00:09:59] Which you know it's funny you look at the popularity of an info graphic almost. And I think it goes to tell you there is so much information out there and it's like you know I talk about hacks and all this stuff and it's like at some point you just let's just do it. And so if you can see it in front of you every day I love it a living document. The next two things that I talked about because I love them and I feel like they go hand in hand is the tagline of the book which for the listeners is get new customers make more money and stand out from the crowd. Kind of goes in line with with what you talk about in the book which is the fastest path to money. And and I love this because you know there is a lot of noise there is a lot of information online. Follow your passion do what makes your heart sing. Kim: [00:10:41] And absolutely but if you don't have money to put food on the table you're not going to want to pursue the passion. So exactly I just would love your input. And can you share some of the listeners with a book about both those pieces. Sure sure. Allan: [00:10:55] I look very common advice you'll get from coaches and consultants and things like that. You know they'll work hard follow your passion. All of this sort of stuff. That's awesome Look. Look. We're way into that. I'm up for following passion I'm up for working hard and all of that. But as in terms of specific advice I mean that's not generally very helpful. Allan: [00:11:18] So what I do in the book I liken money to oxygen and it comes from Zig Ziglar quite where he says money isn't everything but it ranks right up there with oxygen. And that really I mean you would have heard the phrase cash flow is king in the business because the fastest way to kill a business is basically to cut it cut off the cash flow exactly like like like a human. You know when a business needs cash. Allan: [00:11:51] So that's one of the things I say early on in the book if you are uncomfortable with the notion of being in business to make money then this book is really not for you look to for something else on Amazon because this book is about the fastest possible money to get. And the reason for that is not because we are trying to be great or any of those sort of things it's because money helps you solve problems. And you know it's handy because most businesses are schools. Yes. Allan: [00:12:19] And second thing is you know once you've taken care of yourself once you're able to run a successful business then you can start helping others. You can give back to the community. You can follow you follow your passion you can support causes that are important to you but if you're broke and if you're freaking out about where your next paycheck is going to come you really don't have the mindset for helping others and being able to facilitate that sort of thing. Kim: [00:12:48] Well that's totally it. It's like it's weird. I feel like people have this perspective of online businesses that it's going to happen so much quicker and the work isn't going to be involved and it's like no Sometimes you need to do the work that maybe you don't love until you can get to the place to do the thing you love. And you know so can you talk a little bit about you know what is the fastest path to money. And that's a probably really open ended question. Allan: [00:13:14] Now I know it's a well there's a very specific answer in terms of business. The fastest path to the money is getting good at marketing. Allan: [00:13:24] And the reason I say that is you know let's say let's say you get 50 percent better at negotiation with your suppliers I guess you might squeeze a few points on them to your bottom line or if you get you know 20 percent better at the technical thing you do when your product gets a little bit better and by the few more people might buy it and that sort of thing. But if you get even five or 10 percent better at marketing that can double or triple your business it can expand into effects to your business. So that's what I'm talking about with this book rather than have these small incremental wins. We want to look for the really big wins the stuff that's going to really turn your business around an exponential rise. Kim: [00:14:06] Do you have any examples of people you've worked at or a story because sometimes I think people need to apply it to something tangible. And clients you parked with that you can share. Allan: [00:14:17] Sure. Look look I've worked with a variety of clients from all different industries. Look I don't have a specific mission to mention that particular clients details but I'm a great example. I was always a dead broke geek. I was good at the technical thing that I did you know. Allan: [00:14:34] And basically I was able to turn things around just because I started to focus a little bit on my marketing on understanding that you know being good at the technical thing that I did that was new and getting a little bit better at it. Even a lot better at it was never going to have a massive financial impact to me so... And that's one of the major mistakes people make. They think that having a really really good product that's the most important thing. But I tell people look when someone find out that you have a good product and the answer is off to the board. Allan: [00:15:10] So. So having a good product is a customer retention tool. But before you get the customer before they find that you you've got a good product. You've got to get the customer you've got to get someone to do so. And that's really a marketing skill. Kim: [00:15:26] You know it's interesting as I was thinking about it. I know you're probably familiar with BLT is that like JBU where your forum or people have digital software and an it it's funny because there are plenty of products on either of those platforms that are crap but they're great marketers. And so and and then again I've come across in the Wordpress space where you have these just amazingly dialed coded in out you know not a lot of bloat different plug ins and software but yet they never seem to get the traction because the person who developed it is not a marketer. And so. Right. And it's so true and it's and I know for myself why it has always been a challenge is really marketing myself if I'm the brand its like God. But at the same time what's the likelihood that your market you have to put it out there over and over and over again. Allan: [00:16:20] Yes definitely. And if you just have to think about some of the products over the last few years or last few decades that have died but that have been the leading products in the industry I mean if you think about products like I don't know if you remember and maybe I'm a bit old but is it the Betamax video or is things like the BlackBerry and all. Allan: [00:16:44] All of these things were just leading you know technical products in the areas and now they did all but did. [00:16:55] No totally.. I'm not too I remember all those things too so maybe I'm told. But it's funny and I was even thinking about that with like I don't know. You remember the Nextel phones and had like walkie talkies and now it's like oh I just I just use Voxer on my iPhone if I want to send a quick message and send a quick message to anybody all over the world. That's Fox exactly for free. So yeah absolutely. So now you obviously want people to get the book. Can you talk what is. How do you go through the one page marketing plan. What's the process for. For somebody who wants to do that. Allan: [00:17:26] Sure. So it's basically a single page. Allan: [00:17:28] It's been divided into Norem blocks and H. We've got three blocks that talk about the before process three blocks that talking about the digging process and three blocks that talk about the process. It's it's the whole customer and marketing last cycle from start to end so we started before anyone even knows you likes you trust you. And we end up with someone being a raving fan. Allan: [00:17:56] So we tell you the book basically is a walkthrough of that and oil prices. Building a plan that takes you through the whole entire life cycle and give you. And the book assumes nothing so we do not. And I always had myself in mind as you know from about a decade or so ago when I literally knew nothing about marketing. I was just dead broke. I take cake. And what would I have like to have nine at that site. We don't assume anything and it's just it's basically very simple walks or I'm not a professor a Ph.D. I don't have an MBA. So I've written a very easy to read and understand language. I'm not interested in being an academic or having this as a university paper or anything like that. I put it in really easy to understand and grasp language that anyone can understand and the book assumes nothing. So I we take you through that whole process and the feedback on that has been amazing. I've had I've read some of the reviews on Amazon and you know I think I've only seen a handful of Four-Star thorough Five-Star and I've even had marketing professors in this I you know I learn more from the books than than has a career in teaching marketing so I write them and say backside. That was the idea basically to to to do it in a really simple way and it seemed nothing and just I just want to throw out there for the listeners because I downloaded mine. Kim: [00:19:40] But you can get like a fill in the blank of the one page marketing plan. There's a link in the book. Allan: [00:19:47] There's there's a template and it just literally fill in the blanks. Follow it follow along with the book and fill in the blanks. Allan: [00:19:53] And by the end of the book you will have a comprehensive direct response marketing plan which is huge because then when these shiny objects come around or you see something and I totally keep dissing snapshot and it's not that but it was just for me it was like I cannot I cannot be on one more platform right now. So I'm all about simplifying. And so I love this idea of simple nine grids focus. You know all about let's I want to talk a little bit about the wrong type of business plan which you mentioned in the book can you share a little bit with the listeners what that is. Allan: [00:20:26] Sure. So the wrong type of business plan is exactly as I mentioned at the beginning way. Allan: [00:20:32] You know you so you're I see this document that essentially never going to be used or referenced again it's basically hundreds of pages of charts and graphs and projections. And look I don't have anything against that. I mean sometimes you do need to produce that kind of document but it's not something that you can necessarily reference on a daily basis. And that's going to give you clarity on how what should I be working on today. What should I do. What should I be doing in my marketing and what should I do next. Yes sometimes there is a place that kind of document and it's probably usually when bankers are investors are involved. Allan: [00:21:11] But what I wanted to do is basically create something that was practical that could be pinned up on a wall and be used on a daily basis. Kim: [00:21:21] You know the funny thing too with a lot of that stuff as I have spent more time and energy on advertising and paid traffic. You know there's a certain level of paying for data. But when the amount of time and energy that goes into creating a document that's going in a drawer you have to ask yourself the value and just period end of it. I don't know. It's not 1960. Yeah it was different. So let's talk. This is a very favorite topic of mine is this strategy versus tactics. And so if you could share that and then if you could give examples of both I'd love to hear your thoughts on that. Allan: [00:21:56] So as I mentioned earlier like Shaw a bright shiny object syndrome and is you know it's so popular that you know actually there's this little hack that you can you can get up in the rankings or there's this new tool that will allow you to I don't know what I have to produce in a book really quickly and people get so hung up with these tools and so little little tactics and things to try and get ahead and I don't know where to plug that in the big picture like you should be doing Linked-In should I be doing Twitter should be doing a scene when writing blog articles and all of that. So these things are all just scattered and these are all tactics and there's nothing wrong with them per se but not knowing where they fit into a strategy is you know is basically deadly side to a business because you end up jumping from one thing to another thing to another thing and not really knowing the big picture and not knowing where it fits in. Allan: [00:22:57] So give me an example for example if I'm going to build a house or I would hire an architect first and the architect draws up plans for the house. So that's the strategy. So the strategy is OK we're going to put the Boston. We're going to put the bedroom. We're going to get three different levels. Allan: [00:23:15] Then we go and get permission from the council to do it all. So that's the strategy side. So we need to have that all set up. And then there's the tactics and techniques for building the house. Get that means tactics like lying the breaks digging the foundation putting in the plumbing putting in the electricity. If we had stopped the tactics Reder said let's let's let's build the house without creating a strategy. Like I just outlined bricks and then find that they're all in the wrong place so you dig the foundation and find that it's not deep enough for that sort of thing. So you need both strategies and tactics but you need to start with strategy. Kim: [00:23:55] Totally agree that the strategy is essentially as your foundation right. And so with tactics. So let's say someone you know is listening to the show. And they have I you know I think my audience is a mix of people that maybe have a word press business whether they're freelancers or an agency. But then you've also got information marketers coaches consultants authors that type of thing. And so you know and obviously you know they you want them to map out one page business plan but is there a tactic. Do you think or where where would you start with a strategy. Allan: [00:24:30] So we start with the strategy with a business plan and a marketing plan and that that's kind of the point of the book where we do talk about tactics and we do talk about specific tactics but the whole book is that OK we'll do the tactics sit in our side. So so number one block in the marketing strategy is okay what is my target market. So if I don't know my target market and know that they very specifically I mean what is the point of me doing various tactics like if my target market is not on Facebook what's the point of me spending a lot of time on Facebook or for my target market is not on Twitter or not on Instagram or whatever. Well you know there's just no point so. So a whole big part of what we do in the book is map out. Can we talk about target market. We talk about the message to that target market. We talk about what media to use to reach that target market. Then we go see that the late capture process. So we set up the whole architecture we set up the blueprint and the plan and then we say OK now let's plug the tactics in our case. This is how we reach my goal. This is how we reach people with smile. This is how we use social media and we plug that into the big picture. So now we know exactly where that fits in our marketing strategy and what the goal is. Kim: [00:26:00] That was awesome. What about somebody who doesn't know maybe you know where they are. It's a brand new business. And you know they're looking to get out there and they have an idea of who their target market is or who they want to target. You know and just again using Facebook as an example it always amazes me when you actually go look at insights on a page that maybe is actively engaging you want to start you know driving ads or doing custom audiences and you start looking at that and it's like oh wow there's there's you know one gender one age demographic specifically So how do you how would you guide somebody who doesn't have the data yet for any of that. Sure. Allan: [00:26:39] So. So there's really no excuse to be gone these days of the diet. And part of what we do is try to committing to to something in a big way we test and measure. We can put I guess small bits to figure out. I can I can put down say 100 or 200 dollars in Facebook ad money and I can validate a market or a product that way I can say OK. Is there really someone willing to pay for that. So it was with a very small budget. You can actually test and validate and say OK. Is there really a market for this product or for this service or for this target demographic and then your answer then is are they yes or no. And if it's yes then well let's let's invest in that let's put more into it. Let's map out a plan to get these customers and keep them driving right and customers. And if there's not we just cut it and we we forget about it. So we want to be very unemotional when it comes to choosing a target market. And and and the product or service we want to do the stuff that has a very high probability of success. A lot of people will will just sky will say I have a feeling this is a good target market. Allan: [00:28:04] They are I have a feeling this product will work and I'm a pretty experienced market. And even though I get this very many times sometimes what I think would have worked it just doesn't and sometimes what I think wouldn't have worked just blows off and goes crazy so I've learnt never to rely on my own intuition. I just want to test and measure and see empirically from the doctor. Allan: [00:28:27] Is there someone willing and able to buy this product or service with testing and obviously you know whether it's testing a Facebook ad or you know I've done some simple tests with you know vertical niches and you know testing engagement on a page and because you can run cheap likes and just start building it up that way. And so from that perspective and obviously again like I feel like I keep trying to like. All right let's go sideways over here Alan. But we've got the business plan is there. Where do you feel and I know you don't have a crystal ball but are some solid things that people could you know a tactic whether it is e-mail marketing or and I get it that it's going to be niche specific but you know is there one thing that people could start implementing today that would make the biggest difference. Allan: [00:29:16] It's really against my whole philosophy to just recommend one particular tactic because I just don't know the specifics of the business but what I will say is is that people tend to resolve to be good at the business of what they do. Allan: [00:29:33] So rather than just the technical thing and what they do so very often I'll ask someone you know who's struggling in business. Tell me about your industry and his book it's terrible. So competitive online is Cowpens taking all of our customers away and you know the margins are just razor thin and it's really difficult. And then I ask another question. Is there one else your industry is doing really well and nine times out of 10. They always say oh yes this is my competitive pace and he's just doing great guns. But you know it's because of this and this and this and I said look if this someone doing it in every industry that somebody who's doing really really well and someone who's just barely breaking even and the main difference is the guys who are doing really really well are good at the business of what I do. Not just a technical thing of what they do and the guys who are struggling might be good at the technical thing but they're not good at the business side side. So the one thing if I could leave you know people with is basically resolve to be good at the business of what you do and resolve to become a good market and not just a good technician. Kim: [00:30:46] I love that. I'm totally glad you did not give that tactic. It made me think of the story and I I for the life of me I cannot remember the name of the company. It was a Content Marketing Institute and one of their books where they talk about it was a fiberglass pool manufacturer and and their company got hit really hard in the recession in 2008 and he went real grassroots and just started massive Content Marketing about customers questions he knew his business and he started in and it was just now I think he is like the leading manufacturer in the United States. But the point being he knew his business like you said and so it wasn't about that. And please correct me if this is not along the right path. But he really knew what he was doing and he knew how to. You just answered the customer's questions and addressed that and did not worry about what other people were and were not doing and he just went out there and started creating massive content to solve problems. Allan: [00:31:43] That's absolutely fantastic. And questions from your customers at one of the best sources so creating cases of content. Allan: [00:31:52] Because it's one quick one. Customer has that question. It's likely another hundred Sundquist said people will be able literally talk to the search engine into Google. So people were literally typing out what type of call should I get for these kind of yaad and all of this. So it's absolutely a great strategy with the way you use questions to customers and turn that into pieces of content. Kim: [00:32:18] Yeah. So thank you for validating that. And again I just I love the fact that it was really big get to your business. So what is on the horizon for you and your company this year. Sure. Allan: [00:32:29] Look on the back of this book we will be releasing a cost producing side basically taking people through this visually. We're just at the moment in production of getting an audio book version of this. Dunst said by the time people hear this we shouldn't have audio book version on dot com side. Yes. And basically just just helping people with their business and their marketing. Basically through coaching through our products through books and publications and through the blog site that's just where we continue to see. Kim: [00:33:11] Yeah finish the year on a high note with what you're already focused on getting out. I can't you know it's one of those things I've thought about. Really I started outlining it loved write a book. So how was that process for you. Just a last little fun question. Allan: [00:33:24] I look at nearly killed me. Allan: [00:33:26] But I did it at a very short compressed period on literally. I did this book in about 30 to 40 days. I was I was doing 12 sitting for an hour. But I mean you don't have to do in such a crazy fashion. But if I did it out of the period of three four months I can take it easy. But I really just wanted to get it out there. I had the outline already and it was just a matter of pumping up the material. So yeah I'm glad I did do that but yeah if you do it in a more sane time I'm going to say it's really not that big a deal. Kim: [00:34:01] But you got it out and it's doing well. Allan: [00:34:03] Exactly. Exactly yes it's doing very well. [00:34:06] Awesome. So Alan is the best place for people to connect with you. Allan: [00:34:11] blog is that successful start com so you can you can join my mailing list there too. Pace said the number one piece of data in so many cases that pay the doctor home. So that's the landing page for my book can and they can see some of the material from the book and you can. It will take you to the Amazon link to buy it if you want to. So I guess success was a. On one page dot com. Awesome. Kim: [00:34:40] And everybody listening. Again all the links to everything will be in the show now. And it's I love the book. I've downloaded the resources. I highly recommend it. Alan thank you so much for being here.